Like the online A-listers that they are, SEO and Paid Search must inevitably share the spotlight, especially in the wake of Google’s latest algorithmic update. Like a red carpet where only a few can fit, Google has allowed more space for paid ads, pushing organic search results to the bottom of the page and out of the limelight. With the two types of search results seemingly competing for the attention of the audience, it makes sense that they wouldn’t get along. It might surprise you to find out that these very different methods for getting your URLs to appear in search results can work in tandem for an even better outcome than either on its own! Just like two Hollywood stars who are both rivals and teammates, SEO and PPC are the true definition of frenemies. Just imagine two of the top pop stars scheduled to headline different concerts on the same night. Inevitably fans would have to choose which concert to attend, while missing the other. Each show would have its high points, but neither would have the ultimate appeal of a concert featuring both stars. That theoretical concert would have the potential to attract twice as many fans, while capitalizing on the unique strengths of both performers. I know what you’re thinking; maybe there would be some sort of sing-off with each star trying to outperform the other. It could happen, but it would only benefit the fans, right? Beyond the lack of sparkly clothes and catchy beats, SEO and PPC are the same. If both techniques are utilized to their full extent in tandem, the chances of readers finding the designated URLs double. When it’s off season and PPC spend is low, SEO might pull ahead with a fresh new piece of content or a recently updated product page, and when organic search results drop to the bottom of the page, PPC steals the show with an eye-catching add that attracts the ideal customer. While their ultimate goal is the same, PPC and SEO have innate abilities which allow them to appeal to separate groups. To stick with the star-studded analogy, it’s as if a punk rock band is opening for a hip hop artist. Some fans will come for the punk, while others will come for the hip hop. No matter which artist attracted them, they’ll all end up at the same venue. SEO and PPC can work the same way. By tracking and studying analytics, it’s possible to examine demographics in order to better understand who clicks ads. If ads are predominantly being clicked by men, imagery and wording can be adapted to become even more attractive to them. If analytics show that the bulk of organic search traffic is arriving at the site through blog posts, creating more blog posts and sharing them on social media will help boost this traffic. By speaking directly to a designated audience type, more qualified traffic will come to the site and convert to sales. 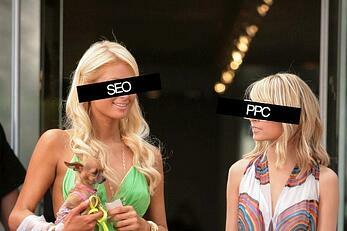 Like all celebrity frenemies, SEO and PPC are able to “get along” because they both secretly think they’re the best. While this unspoken truth might cause rifts between SEO and PPC professionals, it only benefits the sites that employ both tactics. Like a fan who can’t choose a favorite star, Google will always make a place for both sets of search results. Likewise, searchers will always have a favorite too. As a web marketing professional, it makes the most sense to advise a client to invest in both services, explaining that it broadens the chances of their URL getting found. If SEO is the demure, underrated indie film star, PPC is the flashy Hollywood starlet. Each will attract a crowd at their own film premiere, but theaters won’t sell out until they share the screen. With the targeted, direct presence of paid search ads and the tactfully engaging companionship of SEO, any site can build an unrivaled fan base.